During this Bike-to-School-and-Work Week which Clint Loper helped to create, we mourn the phenomenal community activist who died on Wednesday, May 18, after a two-month battle with leukemia. 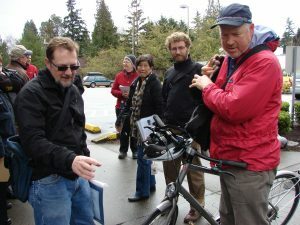 Clint Loper (at left) talks with Mayor McGinn about Clint’s bike, as the mayor arrived in Wedgwood for a tour of the neighborhood in March 2012. Clint Loper was a SuperDad who, as his children attended Bryant Elementary and Eckstein Middle School, helped to create the Bike to School program which flourishes today. Clint was always active in interacting with City of Seattle programs to create awareness of the benefits of biking and the need for safe routes to school. During this Bike-to-Work-and-School Week of May 16 to 20 let’s honor Clint’s memory — get out there and ride.